Harriet Beecher Stowe’s novel, Uncle Tom’s Cabin, continues to be the most powerful literary achievement in the history of American literature. Harriet Beecher Stowe’s novel, Uncle Tom’s Cabin, continues to be the most powerful literary achievement in the history of American literature. 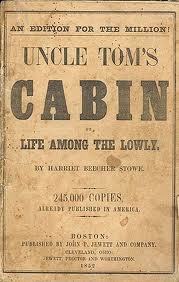 Uncle Tom's Cabin research papers have been written by literature experts. We can produce a custom written project following your guidelines. I. Stowe’s novel demonstrated the power of literature to make social and political changes. II. Both historical and contemporary critics found much to praise and to condemn in Uncle Tom’s Cabin; thereby illustrating its controversial yet vital place in American literature. The power of the novel can be seen in the social and political impact on society; the intense critical foment it created, both positive and negative; and in its revival once again in contemporary literary criticism. Though many critics held that Stowe’s seminal work was specific and particular only to the condition of slavery and therefore was no longer important after the abolition of slavery, it is clear that Stowe’s message is timeless and both her literary and social contributions to literature deserve great attention and reevaluation for their power to unmask the dichotomies in society that punish the weak and favor those who hold political and social power; thus, Stowe’s novel about slavery also reveals inequality not only between master and slave, but also between male and female, such that Uncle Tom’s Cabin can also be seen as a pivotal point in feminist literature. Book Censorship - Book censorship in the United States includes John Steinbeck's The Grapes of Wrath, James Joyce's Ulysses, Uncle Tom's Cabin by Harriet and many others. Order a research paper on censorship from Paper Masters. Ain't I a Woman - African American Literature research papers look at the great works of literature and discuss the dramatic changes of feminism. about southern culture and the oppression African American's experienced for decades after slavery was abolished. Paper Masters writes custom research papers on Harriet Beecher Stowe’s novel, Uncle Tom’s Cabin.